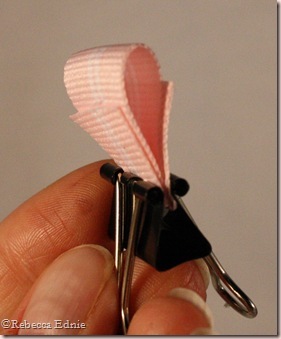 Here is a mini tutorial for the bow I made for this card. I started to explain how I made this bow and meant to add the photos before I posted, but forgot, as usual. So here is LINK to the original post in case you missed it. Step 2. Apply a thin line of glue at the mark on one side only, allow to dry slightly. My line of glue is a bit too wide at one end(rushing), a thin line is all that is needed. Step 3. Gently press the marked points together. DO NOT PRESS TOO HARD, YOU DO NOT WANT YOUR GLUE LINE TO SPREAD OUT AND GET WIDER! Step 4. I like to hold the ribbon with a clamp during drying. It is very hard to get a clip to hold on straight by clipping it on from the side so I fold up my ribbon tails and clamp this way. Use a bigger clamp for wider ribbon. You DO NOT want pressure right on top of the glue or it will squish it making the line of glue not so thin anymore. You want it thin or it won’t lay as flat in following steps. Notice my clamp is just ABOVE where the glue was placed, not on it. Let it almost fully dry. Step 5. Press the middle of the loop down. See how you now have two loops?It is so easy to get the loops the same size this way!! If your glue is still tacky, it should hold when you press it together, otherwise add a tiny dab of glue. I use a clamp again to finish the drying process, sometimes I use one on each side. This makes it easier to complete the center of the bow. Seems like a lot of steps but with quick dry glue this takes about 60-90 seconds. If you use traditional white glue or other slow drying glues, it will take a lot longer. Step 6. Now all you have to do is wrap a second ribbon around the middle of the bow, it doesn’t even have to overlap on the back side but I usually do unless thickness is an issue. I clamp again until the glue dries. 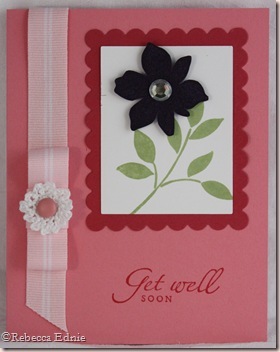 You can barely see the center wrap in my photo because my flower mostly obscures it, sorry, I decided to do the tutorial after finishing the card and giving it away! 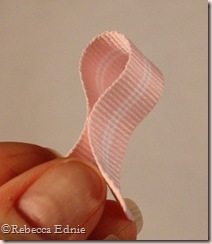 TIPS: I traditionally use this bow for stiffer ribbons like grosgrain that do not tie a nice ordinary bow. If you want an even puffier bow, slip foam dots inside the loops and/or under the loops! Try a contrasting ribbon for the bow center. What about a narrower ribbon or lace over the base ribbon for another fun look. This will also work with cardstock or even patterned paper but definitely use foam dots to support the loops or you will get creases in them. Great for home dec or 3-D objects where the loops will not be crushed inside a scrapbook or in an envelope! 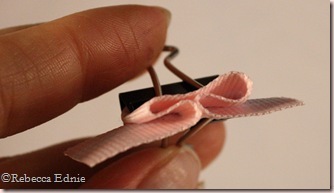 If you use a very soft ribbon, try crimping the ribbon before adding the center wrap. This is a very tailored bow so use it for an elegant, finished look. Great for wedding pictures! I really like this method because it has two advantages over most bows of its type which have at least 2-4 more layers involved. 1. If you are really low on ribbon, it saves a bit! 2. If thickness matters, like when you are using a specialty ribbon, working on a ‘flat’ scrapbook/mini album or minimizing bulk in an already overstuffed album, saving on thickness could be great. It is also much less fiddly than other methods of making this type of bow and you don’t have to worry much about where the center of the bow is, it all falls into place!